Hurricane Irma is moving south of due west near 15 mph (24 km/h) over the eastern tropical Atlantic Ocean, and this general motion is expected to continue for the next couple of days. There are no coastal watches or warnings in effect. Interests in the northern Leeward Islands should monitor the progress of Irma. 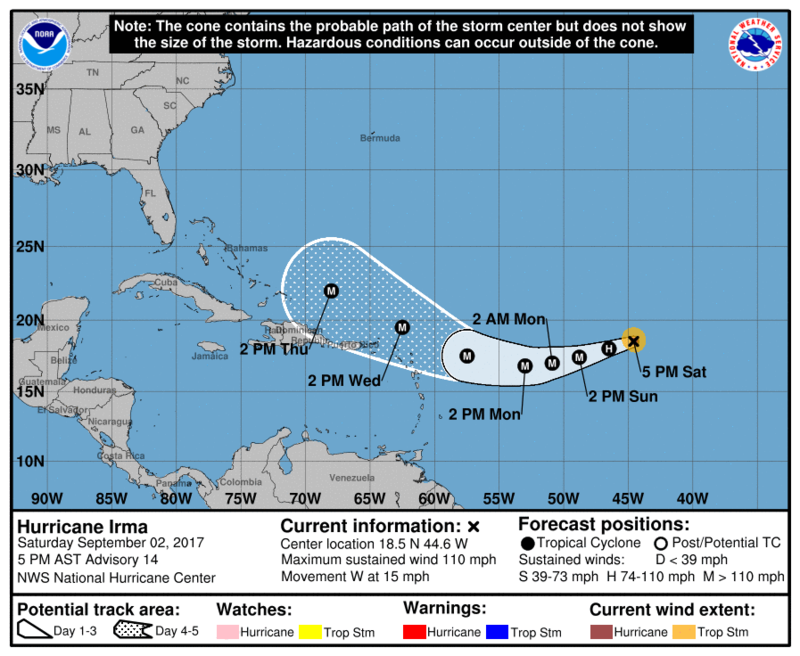 Irma is centered as of 5 p.m. AST/EDT about 1135 miles (1825 km) east of the Leeward Islands. Maximum sustained winds are near 110 mph (175 km/h) with higher gusts –Â a Category 2 hurricane on the Saffir-Simpson Hurricane Wind Scale. Some strengthening during the next 48 hours is forecast. Irma is currently a small hurricane, with hurricane-force winds extending outward up to 25 miles (35 km) from the center and tropical-storm-force winds extending outward up to 70 miles (110 km). However, the hurricane is expected to grow in size during the next couple of days.